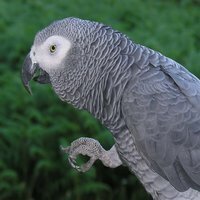 The African Grey Parrot is a wonderful and highly intelligent bird. African Grey Parrots are very sociable and require a lot of attention and interaction.African Grey Parrots can be loving and playful and then in the next moment turn demanding and standoffish. As they are very sensitive and intuitive to what is going on around them in their environment, we as their companions must also be in tune to their needs and wants. Take the time to observe your African Grey as it plays, explores and interacts. African Grey body language, from the eyes, posture and reactions, is very telling. A suitable cage for an African Grey Parrot is at least 2 feet deep by 3 feet wide by 4 feet high (61 x 91 x 122 cm) and has a playpen top with a tray. African Grey Parrots are very active and need a lot of "out" time. Its important to make sure that there are toys both inside the cage and outside in the playpen area to keep your African Grey busy. The location of the African Grey cage in your home is very important. African Grey Parrots are flock members and like to be where the action is. They need the human interaction and their curiosity to know what is going on makes the place where the cage is essential to their health and happiness. Most African Greys cages seem to live in dining and living rooms, but remember not to expose the cage on all sides so they will still have a secure feeling when in their home. Sweet potatoes,Carrots,Yellow and Butternut squashes,Collard greens,Broccoli (good source of calcium),Kale (also a good source of calcium),Peppers – green, red, chili,Celery,Zucchini,Cucumbers,Green beans,Peas – garden and snow,Leaf lettuce. Melons,Kiwi,Apples,Mango and Papaya,Grapes,Oranges,Berries – blueberries, blackberries, raspberries, strawberries. A common deficiency found in an African Greys diet is Vitamin A or beta-carotene, so it is important to provide beta-carotene vegetables on a daily basis. Calcium is also extremely important, as it is the predominant mineral in birds bodies. It is essential for healthy bones, nerve and heart function, muscle contraction and blood clotting. An avian veterinarian should check your African Grey yearly for calcium levels. Water is a very important part of your African Greys care. Make sure they have fresh water in a clean bowl on a daily basis. If you question the water quality, give them bottled spring water – never distilled water as that has all the minerals and nutrients taken away. Pinning: African Greys and other birds are able to control their irises and you can see their pupils rapidly enlarging and shrinking. This is called "pinning". Eye pinning goes along with what is happening in the immediate environment and body posture. If your African Greys body is relaxed and its eyes are pinning it usually means they are interested in or concentrating on something. However, if your African Greys feathers are puffed out and their eyes are narrowed and pinning. Hanging upside down: African Grey Parrots love to hang upside down.